We’ve all been guilty of doing karaoke and breaking out some 80s classics, especially the power ballads. If you haven’t belted out “Sister Christian” by Night Ranger once or twice, then you better add that one to your setlist. Night Ranger was one of those bands who came along in the 80s as the whole “hair band” era was taking off, but they never truly fit into that category. They were more substance over style, but they were definitely staples of MTV especially when their 1983 album Midnight Madness exploded. 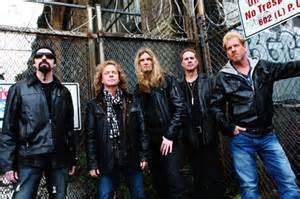 Lead singer Jack Blades left in 1989 and formed Damn Yankees and the band attempted to continue on but eventually folded, even though attempting to carry on with a new lead singer. Blades returned in 1996 and all five original members began work on a new album. After a few personnel changes, original members Blades, guitarist Brad Gillis and drummer Kelly Keagy remain and joining them are guitarist Joel Hoekstra (Trans Siberian Orchestra/Rock of Ages) and keyboardist Eric Levy round out the band. The band’s more focused than ever and having the time of their lives. I caught up with lead singer Jack Blades before a recent show and we reminisced about the past and looked ahead to their creative future. Johnny: Just a few miles from here, I used to crank Dawn Patrol and Midnight Madness in my bedroom on vinyl and here you are in my hometown to perform a concert. This is just so surreal for me as a fan of the band. Now, of course, you guys are playing a Nascar race track tonight. Is this a first for you ? 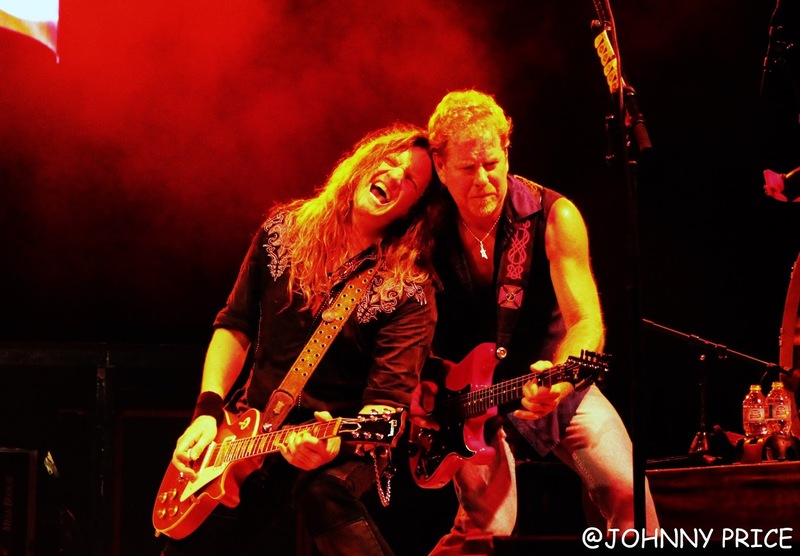 Jack Blades/Night Ranger: This is actually our third one; we played Ontario and Richmond, Virginia. How different is it to do one of these? Jack/NR: Oh man, I love it! Tonight is a little different because the other two were actually before the race or whatever and it’s been massively amazing. It was pretty wild! After being a fan of the band for 30 years, I finally got to cross you off of my concert bucket list last year when you played with 38 Special. Now, either all five of you deserve an Oscar for Best Actor or you are having a blast up there on stage. Jack Blades/Night Ranger: Oh yeah, it’s the real deal man. At this stage of the game, we want this to be fun. We’ve proven who we are and we don’t have to prove anything anymore. We’ve been doing this for 30 years now, so at this point, you wither get out there and have fun or why even do it at all? You know what I mean? That’s our attitude right now and we actually genuinely have fun out there and how can you not have a great time? I mean, we look out at the audience and we see all those people singing along to all of our songs and they’re smiling and rocking out. It really makes for a great interactive evening. It’s also very contagious from the fans point of view. I mean, if you’ve been having a crappy day and you come to a Night Ranger show. Exactly! Reality may come crashing down the day after, but one of your shows if definitely an escape from all the “stuff” that may be going on in their lives. You guys never seem to slow down, even when it comes to new material. I know a lot of bands from the 80s just do the whole nostalgia thing and don’t record new material, but not you guys. You put out two great studio albums so far in the 2000s with Hole in the Sun in 2007/2008 and Somewhere in California in 2011, plus the 12 Strings and a Drummer: Live and Acoustic release. Jack/NR: Actually, that was 24 Strings and a Drummer. Oh my god, I am sorry; I can’t believe I got that wrong. Wow, I was only half on my game for that one. Well, what I was going to ask was if there are any plans on another studio album of new material? Jack/NR: We’re actually in the middle of cutting a new album. We’ve got about twelve songs recorded and it will be finished by the end of the year and will be released the beginning of next year. Wow, I had no idea that you guys were even working on a new one, much less that close to having it finished. I loved the last two and I can’t wait to hear what you have in store for this one. Jack/NR: Thanks man, you know it’s really fun right now. I’ve always felt that you have to keep creating, whether you are an artist, photographer, painter or whatever you do, when you stop creating is when you start dying inside. You know what I mean? We’re just going to keep on creating until we can’t anymore. Earlier, you mentioned that you had been doing this for 30 years. In October of this year, Midnight Madness turns 30. (Note: This was a huge album in the band’s career and contained the hits “You Can Still Rock in America”, “When You Close Your Eyes” and “Sister Christian”) Are you guys going to do anything special to commemorate that? Jack/NR: Yeah, we’ve thinking about doing the whole album. You know, maybe do a few special shows and perform the album in its entirety. That would be pretty surreal! Jack/NR: Yeah, I think it would be pretty cool. Speaking of cool things, you guys are taking part on this year’s KISS Kruise. I know this is your first time on that one, but have you ever done any of the other rock cruises that are out there? Jack/NR: We did a Monsters of Rock cruise last year or two years ago; I can’t remember exactly when that was. We’re looking forward to doing the KISS one; we know those guys and go way back with them. In fact, our first tour in December of 1982 was with KISS. They were still wearing the makeup and they had Vinnie Vincent with them on guitar. Oh wow, that was right near the end of the original makeup era. Jack/NR: Yeah, you’re right; it was the Creatures of the Night Tour. Speaking of that first tour, Kelly (Keagy) was the very first drummer who I ever saw with his drumkit turned sideways like that. How did that originate? Jack/NR: We were an opening act and we didn’t have a lot of room on the stage. There were already the three of us up front and if we put his drums in front of the headliners drums, then we literally had no room up front to move around some nights. Since Kelly sings lead a lot for us, we thought why don’t we just put him sideways and put our keyboards at the other end. It really didn’t happen by design, it happened more by convenience and for expediency sake and that became our thing. One last quick question because I know you guys have to go get ready. What’s the biggest difference touring now as opposed to back in the 80s? Jack/NR: I think right now we’re having a lot more fun. Now, back then it was pretty crazy and pretty wild and stuff like that, but we’re a lot less severely medicated right now (laughs).I love it because we’re really experiencing everything this time around and really enjoying it.